Abu Dhabi University organized a seminar about the preventative aspects of genetic disorders in the UAE and the Arab world and the challenges raised by these diseases. The seminar was delivered by Dr. Ghazi Tadmouri, the Assistant Director for the Centre of Arab Genomic Studies. In attendance were H.E. Ali Saeed Bin Harmal Al Dhaheri, ADU Director of the Executive Board, Dr. Nabil Ibrahim, the ADU Chancellor, College deans, and a number of faculty members and students. H.E. Ali Saeed Bin Harmal Al Dhaheri highlighted the significance of this event, which signifies the university's commitment to spreading awareness to community members regarding this important topic. It is of major concern to people and it is vital that the elements related to it, through the scientific vision provided by the Centre of Arab Genomic Studies, are presented to the community. Bin Harmal mentioned that hereditary disease is a national priority issue which demands cooperation and combined efforts to spread the awareness needed for people who are thinking of getting married and the scientific and medical measures that needs to be considered in order to avoid spreading these diseases to infants. Bin Harmal pointed out that ADU was keen on choosing topics to be discussed in its cultural season with care in order to address topics which affect the community and provides details and answers by experts and specialists. Dr. Ghazi underlined the importance of spreading awareness about hereditary diseases amongst community members, adding that the latest research in this field show that there are 240 different types of hereditary diseases in the UAE. These diseases are not restricted to a specific region or nation however; the names and percentages vary from one place to another. Dr. Ghazi mentioned that international reports on hereditary diseases showed that the first 15 countries where these diseases are spread are all Arab countries, including the UAE which came in the 9th place. The percentages also show that western countries have very low percentages compared to the Arab world and this might be because of kinship marriage which is common in the Arab world, where one out of two marriages in the UAE takes place between cousins or couples who are in the same family. This might be for several reasons, such as the low percentage of locals compared to expatriates in the UAE, maintaining money inside the family, and knowing a person from the family better than a stranger. Dr. Ghazi noted that the hereditary diseases have a negative impact on the economy due to the fact that they are chronic in nature with lifelong management and no definitive cure. This is exacerbated by resulting effects such as spontaneous abortion, neonatal death, morbidity and mortality in children and adults, longer hospital admissions, higher number of surgeries, expensive total cost paid, and traveling farther to obtain better treatment. Dr. Ghazi said that the annual cost dedicated treatments of hereditary diseases in the Arab world has reached 13 billion dollars. Dr. Ghazi mentioned that the vision of H.H. Sheikh Hamdan Bin Rashid Al Maktoum, Deputy Ruler of Dubai, Minister of Finance and Industry, is to alleviate human suffering from genetic diseases in the Arab World. This was crystallized in the establishment of the Centre for Arab Genomic Studies (CAGS) to characterize and prevent genetic disorders and transfigure the future practice of health care in the region. The Centre was inaugurated on 25th June 2003 by H.E. Hamad Abdul Rahman Al Midfaa, Minister of Health, and Chairman of the Board of Trustees of the Sheikh Hamdan Bin Rashid Al Maktoum Award for Medical Sciences, at the Genetic Centre at Al Wasl Hospital. At present, offices of the Centre for Arab Genomic Studies are located within the premises of H.H. Sheikh Hamdan Bin Rashid Al Maktoum Award for Medical Sciences, Dubai, UAE. Dr. Ghazi added that CAGS includes two scientific committees: The Executive Board of CAGS is composed of a number of local scientists and it represents the governing body and the legal trustee of all activities of the centre. The Council of CAGS includes a number of regional scientists and it facilitates the exchange of information on genetic disorders occurring in Arab countries. Countries represented in the Council of CAGS currently include: Bahrain, Egypt, Jordan, Kuwait, Lebanon, Oman, Qatar, Saudi Arabia, Sudan, and Tunisia. In the future, CAGS aims to extend memberships to a larger group of scientists and include other Arab countries, adding that some of the priority objectives of the Centre for Arab Genomic Studies are to educate the public and professionals alike on the important impact of genetic diseases in the Arab World and the methods and benefits of early genetic diagnosis. 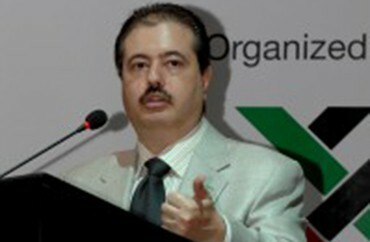 Dr. Ghazi mentioned that the most common disorders include Anencephaly, Breast Cancer, Diabetes Mellitus, Down Syndrome, and Neural Tube defect, and these diseases happen due to radiation exposure, environment, and chromosome failure, adding that there are diseases which are not widely spread but limited to this region such as Al-Gazali syndrome, Fadhil syndrome, and Megarbane syndrome. Dr. Ghazi noted that the statistics show a diversity of diseases when it comes to comparing the UAE, Bahrain, and Oman. The hereditary diseases found in these countries together were 451 amongst which only 30 diseases are common among them, and 119 of the diseases are listed on the fatal list. Dr. Ghazi mentioned that there is often a problem of non-compliance where the patient refuses to abide by the doctor's recommendations, which results in decreased effectiveness of treatment modalities and a financial burden on the society due to excess urgent care visits and hospitalization. Dr. Ghazi added that some parents are not complying with treatment options for their children and disregard medical advice and seek the help of traditional healers leading to disastrous consequences. Sometimes the patient lacks patience or refuses some treatment strategies or surgical interventions. Dr. Ghazi concluded that the roots of non-compliance in the Arab world are due to low level of literacy, and patients may have erroneous assumptions that genetic counselors would advise them on private issues (choice of marriage partner, reproductive options). Dr. Ghazi also mentioned that it's the entire community's responsibility to stick together and try to prevent hereditary diseases by spreading awareness, collect funding, and to address the issue of genetics and hereditary diseases in schools.